I sat through this film yesterday evening at an early screening and many thoughts swirled through my mind. The first, I now know to be true, was that the director of this film was new in the game. Drew Pearce's directorial debut Hotel Artemis is one of the few films I'd give a free pass to be over 2 hours. It runs at 1 hour 37 minutes which would be great if he wasn't trying to play around with 5 storylines at once. I didn't believe any of the characters would exist outside of the story that was being told, except maybe Jodie Foster's. I am 100% not the target audience for this film, sci-fi and crime are not traditional genres I tend to pick out over everything else but I was really intrigued by the concept, which I still think is a really excellent concept, just not executed well at all. Essentially, Jodie Foster has set up Hotel Artemis, a hospital for criminals in a riot filled futuristic LA owned by Wolf-King (though we never really know why he's called Wolf-King or how he owns LA, or why anyone is rioting), and there's basically a bunch of people in for this one particularly wild evening. 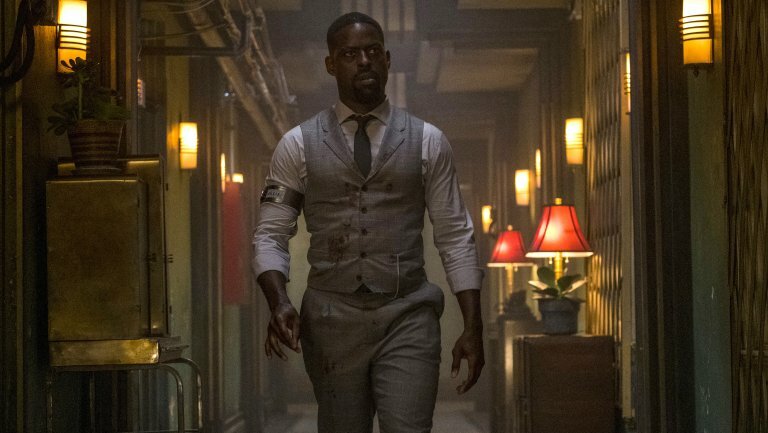 Sterling K. Brown's character Waikiki is in with Honolulu (Brian Tyree Henry) and we've got Sofia Boutella as Nice and Charlie Day as Acapulco, they're all criminals staying the night in Hotel Artemis and they all seem to have a problem with each other, though it's never explained why. My biggest issue with this film was that there were so many moments that were just entirely unnecessary and it felt like every character was there to push the story along, not actually exist in the world as real people. For example, the use of Kenneth Choi's character, Buke, was literally just to tell us that Hotel Artemis won't let you in if you're not a member. There were lots of moments similar to that and it was frustrating as an audience member to not be trusted with the information that we had. There's nothing more patronising a director/writer can do than assume the audience aren't paying attention because they will generally switch off. We don't need to be spoon-fed information, that's what your characters are there for. Utilise them. Another problem I had was the character of Nice, a woman in for... I can't tell you why she was there. I was bothered by the fact she wore this red evening dress for the entire thing which would be completely impractical in a city torn by riots, where everyone is running from the police. Maybe I'm overthinking it but it felt like a way to keep the male audience watching and a not-so-subtle hint that she is dangerous. The moment I found myself the most drawn into was when Jodie Foster's character (The Nurse - yes that's right, ladies and gentleman, the main character doesn't have a name) was in a dilemma about whether to help an injured policewoman that she knew. If the whole film had been about that relationship and developing Jodie Foster's inner-turmoil over her lost son and what this job really means to her, I imagine this review would be very different. Overall, the film's budget was $15 million and I've seen better films for lower budgets, even in recent years. I don't like to tear people's work apart because I know how much time, effort, blood, sweat and tears goes into making a movie but I am a person who loves character and I had nobody to root for in this film. There were too many unexplained stories combined with over-explained moments, Jodie Foster didn't control the narrative at all, she just had things happen around her, the female characters were drastically under developed and it felt like watching chaos.